So, I started my new job today with the City of Orem, doing park maintenance at the Nielsen's Grove Park on S. Sandhill Road. So far it seems like a great job and I am working with a great group of guys. Today for my first day we went to the Orem City Library and tore out a tree stump. After we tore the stump out we went back to the park and I spent a while doing paper work and learning about the equipment I will be using. At 10 a.m. I had to take a city truck up to the City Center to do orientation, it was quite entertaining, another person also had to do orientation today, so for orientation we had to watch a video about sexual harassment and fill out some paperwork, all of this took about 25 minutes, fastest orientation ever, FANTASTIC!!! 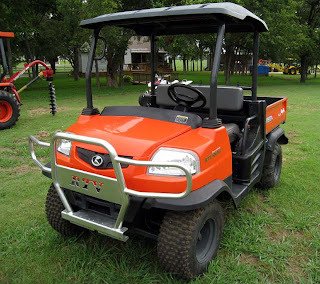 After I finished orientation I was introduced to my new ride, a sweet Kubota RTV 900. This baby is a diesel and has four wheel drive. Pretty much the greatest thing since sliced bread! For the rest of the day i drove this bad boy around the park and fixed broken sprinklers. And that was my first day! Pretty sweet huh?